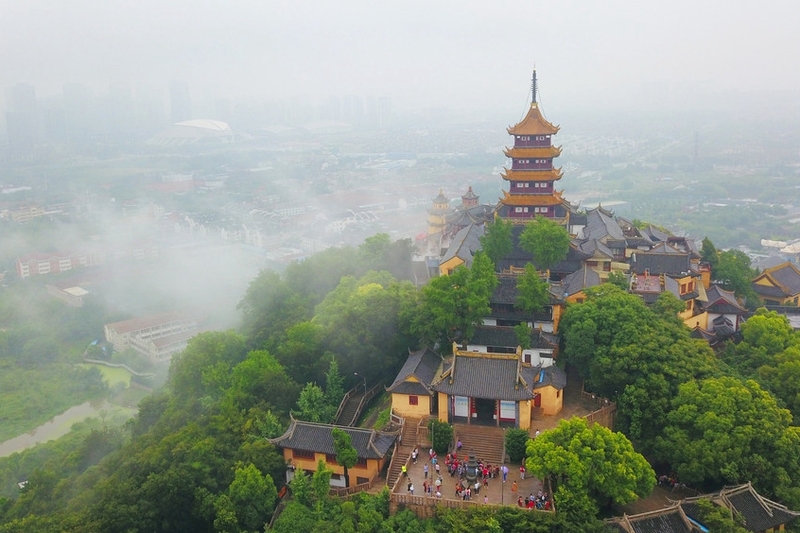 Located in the center of Nantong, a renowned historical and cultural city, Haohe River is one of the most complete and well-preserved city moats in China. According to historical records, the moat was built with the old town in the fifth year of the Xiande Period in the later Zhou Dynasty (958). Haohe River is known as “the Emerald Necklace of Nantong”. Covering an area of 3.23 square kilometers and encompassing the tourist route along the time-honored city moat, the Haohe River Scenic Area consists of Temple Street, Southwest Camp and other historical blocks with the well-maintained layout of an old prefectural capital. It has developed a series of tourism projects integrated with local characteristics, human history, architectural culture, gardening art and folk customs based on abundant non-material cultural heritages, a city moat museum and a modern private garden bequeathed by Zhang Jian (1853–1926), a Chinese entrepreneur, politician and educationist. Trees shade the old street with radiance and enchantment. As an excellent tourist destination incorporating beautiful natural scenery, healthy and comfortable ecology and cultural relics, the open national AAAAA tourist attraction boasts the unique pattern of a waterside town surrounded by a magical moat.